303 Pennsylvania Ave., SE, Washington, D.C.
Burgers are big in our nation’s capital. You can’t drive around without seeing a Five Guys store, which President Obama was shown dropping into a few months back on an NBC special. 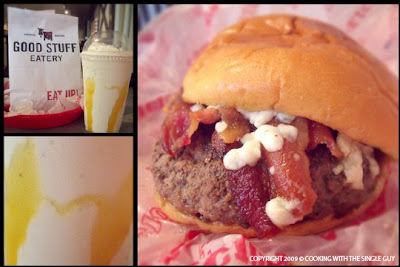 But when I had a hankering for a burger, I sought out Good Stuff Eatery. 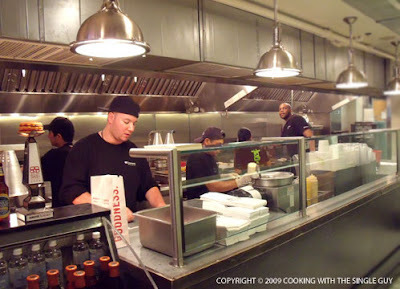 It wasn’t just the cute cow in its logo or the promise of gourmet burgers, it was to see what former “Top Chef” contestant Spike Mendelsohn could do with food. 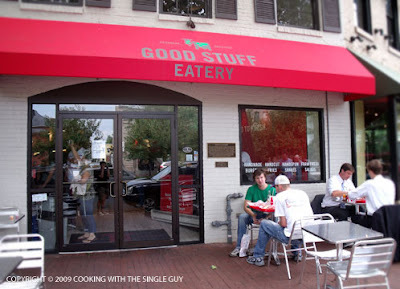 Mendelsohn’s Good Stuff Eatery is just past the Capitol building along the quaint stores and restaurants on Pennsylvania Avenue. From the outside, you wouldn’t know this is a place owned by Mendelsohn of “Top Chef” fame. That is until you walk in and you’re smacked in the face with this huge photo of Mendelsohn in his signature fedora. 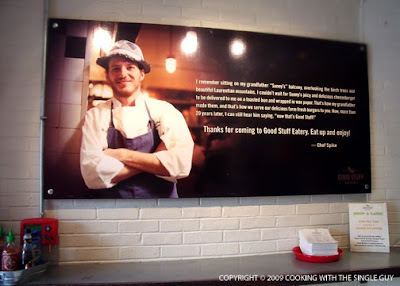 I should say, though, that the large photo poster is the only mention of Mendelsohn (and the only reference to “Top Chef” is a poster that’s on the tiny stairways on the way to the bathroom). For the most part, the restaurant is a celebration of farm-raised goodness and novelty fun. On his menu, Mendelsohn emphasizes the healthy nature of the cows used in his burgers, which range in price from $5.69 to $7.89. Healthy alternatives are abundantly available, including substituting beef in any of the burger options with farm-raised grilled chicken. You can also drop the Pennsylvania Dutch bun and just have your burger wrapped in lettuce. I arrived for a late lunch after checking out some museums on the Mall, and the place wasn’t super busy. There were several gourmet burgers to choose from, and it was a little overwhelming so in the end I decided to try the Prez Obama Burger ($6.89) since I was in D.C.
Good Stuff’s menu also includes wedge salads, fries and chili. There are also several “handspun shakes” and I decided to try the “D-Lechable Leche” shake ($5.25). What’s odd about Good Stuff is that they present all the orders in a bag on a red plastic container, whether you plan to eat in or take out. Seems like a waste of a bag, IMHO, if you’re eating in, but I’m sure there was some logic behind the policy. 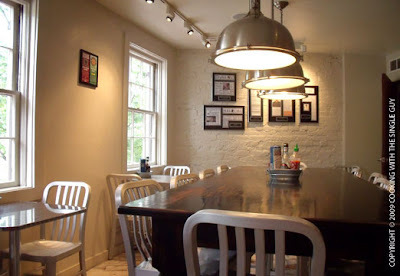 After I got my Prez Obama Burger and shake, I headed upstairs to the dining area, which had a flat-screen TV tuned into CNN and a stylish corner area overlooking the street. The burger is topped with applewood bacon, a red onion marmalade, horseradish mayo, and Roquefort cheese. First off, I have to say the size was smaller than I expected for a gourmet burger. It’s about the same size of the hamburgers at McDonald’s, but triple the price. Still, this is farm-raised and better quality, right? The burger itself was nicely cooked although not super juicy. (They don’t ask you how you want your burger done, and it’s mostly on the well side.) I did enjoy the combination of the bacon with the sweet tang of the marmalade. I didn’t get a big punch of the horseradish, instead it was more a sneaking kick that came later. I also liked the cheese, but I’m a big blue cheese fan. Good Stuff Eatery definitely has the pizzazz of a celebrity chef, but the burgers are really more novelty items than awe-inspiring. It’s like eating one quick-fire burger challenge after another — creative but not much depth, really. I remember this guy...I always thought he was so annoying! However I would probably be compelled to try his place too. I always appreciate your reviews, you are compassionately critical! loved your blog. i reckon you can find spike burgers also in nyc. its really delicious over here. 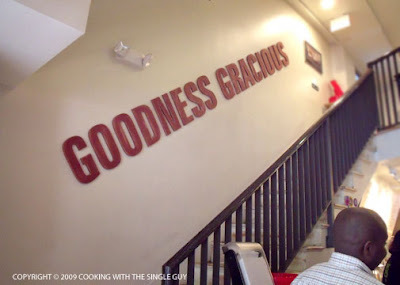 if you get the chance to eat there you should!im hungry!